Last month, Twitter announced the global availability of tailored audiences, which essentially allows brands to target Promoted Tweets using browser cookies. Through this tool, advertisers are able to define their own groups of existing and potential customers on the platform and reach them with relevant messages. 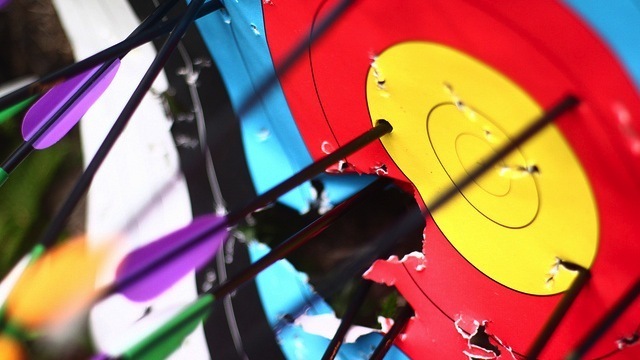 Now Twitter is giving you access to two new targeting options. The company has been testing tailored audiences since July 2013, and is similar to the retargeted ad offering on Facebook. 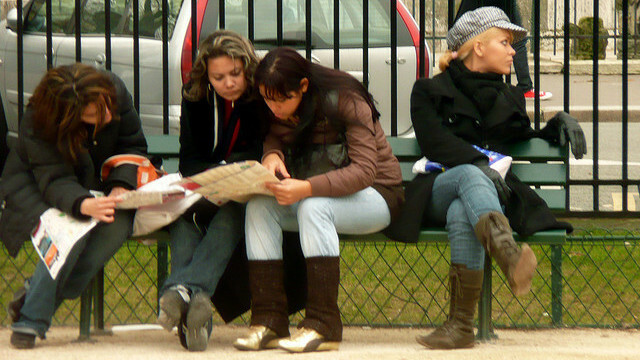 Here’s an example of how tailored audiences can be used. Let’s say a hotel brand wants to advertise a promotion on Twitter and it’d prefer to show its ad to travel enthusiasts who have recently visited its website. In order to get the special offer to people who are also on Twitter, the brand will share a browser ID with the network which can then be matched to Twitter accounts in order to show ideal members a Promoted Tweet with the travel deal. Tailored audiences allows the hotel brand to deliver an ad about something to individuals it knows they’re already interested in. To further expand upon the product, and grant advertisers more flexibility, Twitter announced that tailored audiences will now include email addresses and user IDs. Many businesses already collect customer email addresses for mailing lists, newsletters, and other account details. With this update, you can now use email addresses from your own customer relationship management (CRM) database to create tailored audiences. For example, if a retailer wants to promote a sale on Twitter to current membership cardholders, it can share the hashed email addresses of its card members. Twitter will then match that information to existing accounts on the service in order to show the matched members a Promoted Tweet with the sale details. Twitter also made it so you can create tailored audiences using lists of Twitter IDs — either use names or user IDs. So if the same retailer wants to build relationships with potential customers on Twitter who are influencers in fashion, it can use public information like a member’s bio, follower count, verified status, or past tweets. This is done by using Twitter’s API or Certified Products to identify the specific accounts that best fit your target audience. 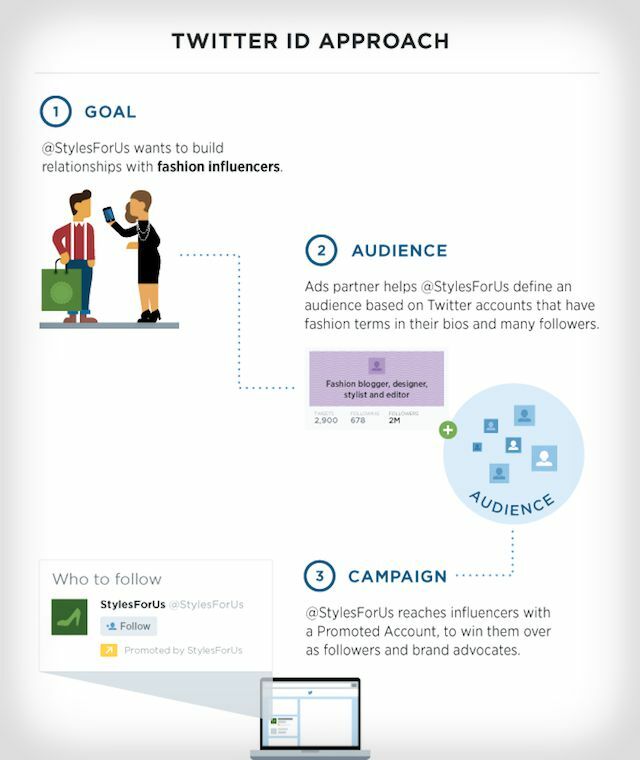 The company can then use this list of Twitter IDs to create a tailored audience through an ads partner, show fashion influencers a Promoted Account, and engage them as followers. Finally, Twitter introduced the ability for you to exclude selected CRM and Twitter ID audiences from the set of members reached through its existing targeting options: interests, keywords, and TV. Let’s say the same retailer would also like to run a new customer acquisition campaign for its membership program. It wants to target Twitter members interested in style and fashion while excluding existing membership cardholders. Through exclusion targeting, the retailer’s same membership cardholder tailored audience can be used to remove any individual who fits the interest targeting and is also already a cardholder. By combining these tools, Twitter has made it so advertisers can create highly relevant messages and reach audiences with more efficient campaigns. You’ll also receive reports including how many people saw, clicked on, or converted from an ad, without identifying specific members. 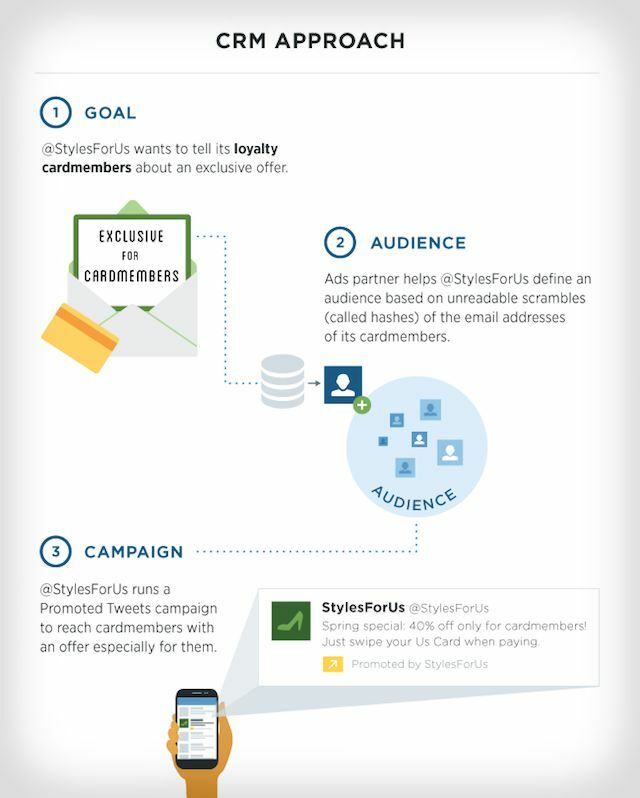 Twitter has partnered with Acxiom, Datalogix, Epsilon, Liveramp, Mailchimp, Merkle, and Salesforce ExactTarget to help you get started with tailored audiences. The company also introduced the creation of CRM and Twitter ID tailored audiences into its Ads API, now available through Ads API partners. You can also contact your account team for more information or sign up for an account at ads.twitter.com.